Promoter Eddie Hearn will be meeting with WBC heavyweight champion Deontay Wilder’s management team next week in New York to work on negotiations for a unification fight between him and heavyweight champion Anthony Joshua. Hearn of Matchroom Boxing will be in New York for his fighter middleweight contender Daniel Jacobs’ fight against Maciej Sulecki on April 28 at the Barclays Center in Brooklyn, New York. 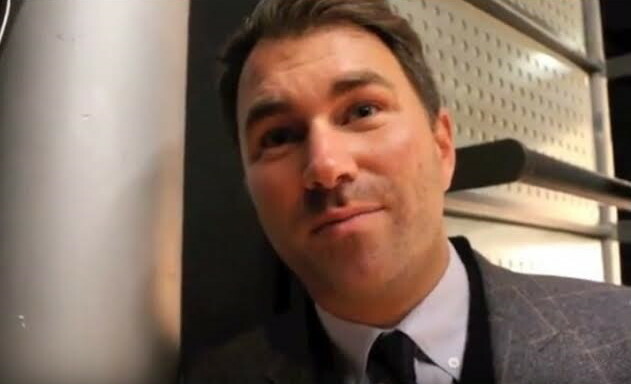 While in New York, Hearn plans on meeting with Wilder’s team to try and hammer out a fight with Joshua for possibly later this year. Hearn wants to get the Joshua-Wilder fight completed this year, because Joshua will have mandatory defenses due in 2019 that will keep him busy. Joshua doesn’t want to vacate his titles, even though it would make things much easier for him to have the freedom to fight whoever he wants to face. The offer Hearn is speaking about is the $12.5 million flat fee offer he made to Wilder for the Joshua fight, which wasn’t well received from the Alabama native and his management team. The problem is that flat fee offers normally aren’t made when it involves two popular fighters. Hearn doesn’t quite understand that his offer was taken as an insult by Team Wilder and not viewed as a serious offer. Flat fee offers are made when a popular fighter is facing a no name opponent, not when they’re looking to fight a popular world champion. The general belief by the boxing public is Hearn is just going through the motions of putting together the Joshua-Wilder fight so that he can say he tried, but without him really being serious about making the fight. By meeting with Team Wilder in New York and once again offering the same flat fee deal to them, Hearn can tell the boxing media that he tried to put the Joshua-Wilder fight together, but Team Wilder wanted too much money. Joshua, 28, could also be in New York with Hearn next week, although that likely won’t change anything as far as the Wilder negotiations goes if the flat fee offer is still on the table. Team Wilder wants a percentage deal closer to 60-40, and the flat fee offer, which could amount to just 12.5% of the purse for the fight, would be grossly unfair if the fight brings in over $100 million like many boxing fans believe it will.